The Gemco 1986 Series resolvers have been the preferred source for rugged and accurate rotary positioning in a variety of industrial applications. The brushless resolver works on the same principle as a rotary transformer to couple power in the rotor. The internal brushless resolver has three separate windings: a reference winding, a SIN winding and a COS winding. The reference winding is excited by an AC voltage. The SIN and COS winding are set 90° apart and provide two different output voltages whose ratio represent absolute position of the shaft. The advantage of resolver transducers over other rotary position products is that resolvers hold up better in harsh environments and they are always absolute, so if power is lost and restored, the exact position data will be communicated. In long cable runs a resolver signal can typically go much further than other technologies. Resolvers have long been the standard rotary position method in packaging, primary metals manufacturing, stamping, automotive, tire and rubber, paper mills and mining. See our different models below. The 1986A Series Foot Mount Resolver has a ¾” input shaft and aluminum mounting foot. It is available as a single turn, multi-turn single and dual resolver packages. Six different Resolver types are available to electrically match any competitor’s package. The 1986B Series Square Flange Resolver is a 2.25” Square Flange mount resolver with a 3/8” input shaft. It is available as a single turn, multi-turn single and dual resolver packages. Six different Resolver types are available to electrically match any competitor’s package. The 1986C Series Square Flange Resolver is a 2.06” Square Flange mount resolver with a 3/8” input shaft. It is available as a single turn, multi-turn single and dual resolver packages. Six different Resolver types are available to electrically match any competitor’s package. The 1986D Series Resolver is a 2.50” Face mount resolver with a 5/8” input shaft. It is available as a single turn, multi-turn single and dual resolver packages. Six different Resolver types are available to electrically match any competitor’s package. The 1986DN Series Resolver combines the reliability and resolution of resolver continuous rotary position sensing with the added flexibility of DeviceNet communications, all in a single device. The resolver technology is the same as used in other Gemco resolvers, proven in such rugged applications as on stamping press automation. The 1986E Series Resolver is a 100mm Face mount resolver with a 5/8” input shaft. It is available as a single turn, multi-turn single and dual resolver packages. Six different Resolver types are available to electrically match any competitor’s package. The 1986F Series Resolver is a 2.50” Square Flange – Block mount resolver with a 5/8” input shaft. It is available as a single resolver package. Six different Resolver types are available to electrically match any competitor’s package. The 1986G Series Resolver is a geared multi-turn 3” x 4-3/4” Square Flange – Block mount resolver with a 5/8” input shaft. It is available in a variety of different gear ratios. Six different Resolver types are available to electrically match any competitor’s package. The 1986GG Series Resolver is a Dual Resolver 3” x 4-3/4” Square Flange – Block mount resolver with a 5/8” input shaft. The 1986GG Series package contains two independent Resolvers, that are geared for absolute multi-turn applications. Three different gear rations are available to meet your application needs. 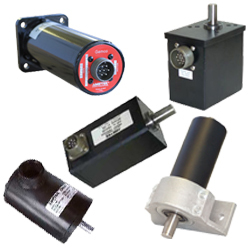 The 1986H Series Resolver is a Servo mount resolver with a 1/4” input shaft. The 1986H Series package contains two independent Resolvers, that are geared for absolute multi-turn applications. The 1986I Series Resolver is a 4.00” Round Face mount resolver with a 5/8” input shaft. It is available as a single turn, and multi-turn resolver packages. Six different Resolver types are available to electrically match any competitor’s package.